Head over to Pier 39 and find something to do for the whole family. Tadpoles will love visiting sea life at the Aquarium of the Bay. Snap photos of the infamous sea lions hanging out on Pier 39 and get a caricature made of the family. The pier is also home to a variety of shops and dining spots for everyone to enjoy and explore. Located on the iconic waterfront at Pier 39 – the Aquarium of the Bay is great for all ages! Journey through the different “Bay” areas of the aquarium and learn, experience, touch and wonder at the amazing eco-systems which support marine life in and around the bay. You’ll stroll through 300 feet of crystal clear tunnels “Under the Bay”. Come eye to eye with a Sevengill shark, be mesmerized by moon jellies, touch a bat ray’s wing, wonder at the beauty of the sea stars and spend time in the many interactive exhibits throughout the facility. Oh and don’t miss the entertaining river otter’s as they romp around their habitat. Plus, the Giant Pacific Octopuses will amaze you with their ability to change color within seconds. The aquarium is a great way to spend a morning or afternoon. It’s open daily and fun for the whole family! Way cool - the Aquarium of the Bay is a non-profit education center and a portion of each ticket purchased helps fund free education programs for local children. Pier 39 at 2 Beach Street (Embarcadero & Beach Streets). During your visit to San Francisco, hop on over to the famous Pier 39, one of the city’s most iconic areas. With the 7-day Pier 39 Attraction Pass & Fun Pack you’ll get access to all Pier 39 has to offer in addition to discounts and special offers in shops, restaurants and attractions. 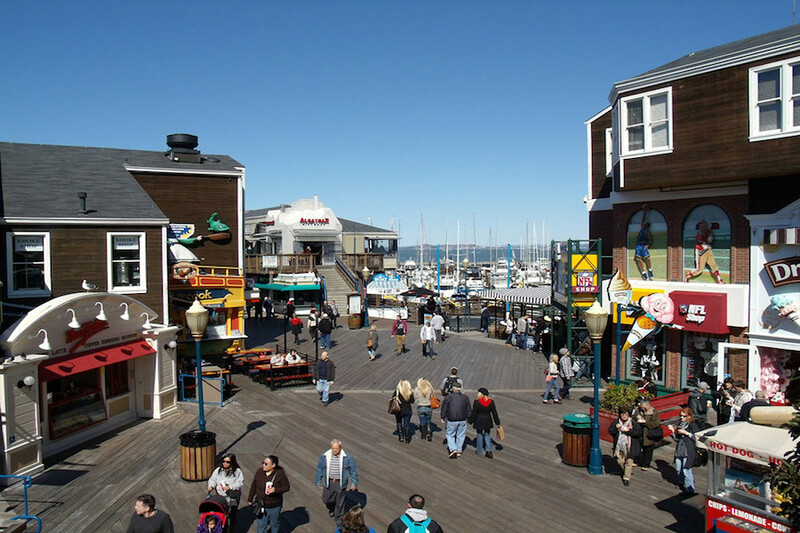 Pier 39 is one of San Francisco's most popular areas to visit and is packed with fun for the whole family! Non-stop panoramic views of the Bay, Golden Gate Bridge and Alcatraz, this bustling festival marketplace showcases more than 110 stores and 12 waterfront restaurants. You’ll see the world famous sea lions, dazzling street performers and daily live entertainment. This all-in-one Attraction Pass includes admission to the Aquarium of the Bay where you’ll get up close to the diverse aquatic life of the San Francisco Bay and its surrounding waters. The pass also includes a relaxing one-hour San Francisco Bay Cruise or Escape from the Rock Cruise and a ticket on the CitySightseeing double decker Hop-On-Hop-Off bus. The Pier 39 Attraction Pass is a great value, and gives you tons of flexibility for things to do during your time in San Francisco! Blue & Gold Fleet Ticket Booth at Pier 39 - Beach Street & Embarcadero. Ticket expires 7 days after first use or 21 days from service date. Whichever comes first.